Robots Are Invading Malls (and Sidewalks) Near You #Robotics « Adafruit Industries – Makers, hackers, artists, designers and engineers! At the upscale Stanford Shopping Center in Palo Alto, California, people are taking selfies with a roving robot that looks like a cross between Wall-E’s girlfriend and R2D2. 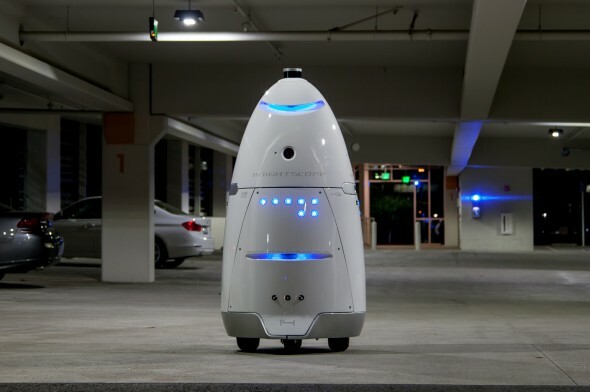 It’s actually a K5 robot security guard—a 300-pound, sensor-filled droid made by a startup called Knightscope that patrols the area and detects suspicious behavior. K5 is part of a small but growing number of human-scale mobile robots that are finding employment outside the confines of industrial settings like factories. They’re invading consumer spaces including retail stores, hotels, and sidewalks in a quest to deliver services alongside human staff members for a fraction of the price of employing people to do a variety of typically unexciting tasks. The machines come with navigation capabilities and safety features to allow them to perform simple jobs autonomously without putting people at risk. “This is not about replacing people, but augmenting them,” says Steve Cousins, CEO of Savioke, which makes a room-service robot called Relay, also known as Botlr. Relay robots currently operate in eight U.S. hotels, making around 25 to 30 daily trips to guest rooms carrying requested items including snacks, toothpaste, and packages. At the Aloft hotel in Cupertino, California, the 36-inch-tall Botlr docks behind the reception desk until a guest calls for an item. A staff member then places the object—a bag of chips, for instance—inside the robot’s 21-liter drum, closes the lid, and uses its touch screen to key in the room number. Then it whizzes off to the elevator—which has been modified so the robot can summon it wirelessly—before navigating to the correct room by using lidar and depth-sensing technology. The Botlr waits until the guest opens the door before opening its lid to reveal the drum’s contents, and then heads back to its charging station downstairs (if the guest doesn’t answer the door, as apparently happened when I visited the hotel, the robot simply brings the item back to its dock). To test the Botlr’s mettle, Cousins sent it on a mock mission within the hotel’s lobby while we purposefully got in its way; it navigated around us very well. Robots have been mingling with humans in several stores, too, including a Target in San Francisco, where a robot called Tally was used for a trial in which it trundled up and down aisles carrying out inventory checks—a mind-numbing task for humans. Tally detects when products are out of stock or moved so staff know to replace them. According to Tally’s creator, a startup called Simbe Robotics, it can complete an audit of a medium-sized store in around half an hour, with 96 percent accuracy. The same task would take a human 25 hours, and the company contends people are only about 65 percent accurate.